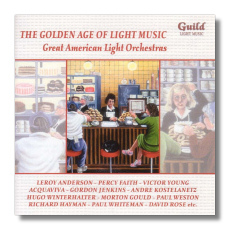 This is the fifth volume in Guild's growing Light Music series that is dedicated to the immense tradition of the American Light Orchestra. There is a veritable treasure trove of recordings here with the main contenders being David Rose, Leroy Anderson, Percy Faith and the inimitable André Kostelanetz apart from several others who flew the flag for the genre throughout the United States. I enjoyed this disc immensely from first note to last and with the fastidiously detailed notes by the indefatigable David Ades, the experience was an even more complete one. Morton Gould's arrangement of Duke Ellington's 'Sophisticated Lady' was particularly effusive whilst the jaunty sounds of Kostelanetz's 'Manhattan Serenade' and Monty Kelly's 'Tropicana' certainly put me into a dancing mood. However it would be unfair to single out particular recordings for special praise as all are very much magical and quite ravishingly excellent. Acquaviva, Harry Horlick, David Carroll and Richard Hayman are also well represented here. Guild's Light Music series is shaping up quite well and one hopes for the classic recordings from Haydn Wood, Ernest Tomlinson, Robert Farnon, Charles Williams and other greats of this genre to have their own albums in this excellently produced series. Otherwise, another warm welcome for this collection; one that should go down extremely well with enthusiasts of the genre.